Lockets and Lace is an upcoming multi-author series centered around the Bavarian Jewelry and Watch Shop established in St. Joseph, Missouri in the 1850’s. Each book will have a locket and some lace figure into the story as well as the characters visiting the shop at some time. Other authors participating in the series will post about aspects of their books, but since the main character in my book, Pearl’s Will, makes lace to sell I thought I’d give a little background on lace. Lacemaking dates back to pre-Christian times, but developed greatly during the Renaissance period. 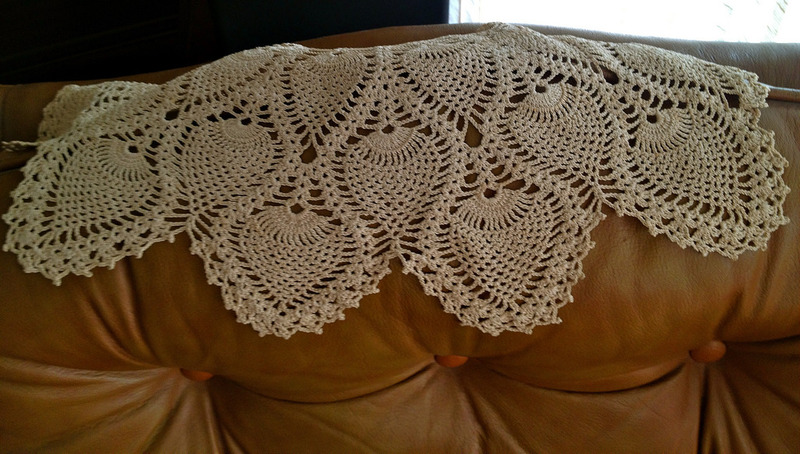 Making lace was something women could do in their homes to provide extra income. Machine-made lace was developed in the 19th century and took over most of the lace making industry. There are many different types of lace, the names of which often reflect the town or province they were developed in. Men wore more lace than women during some eras. I didn’t realize how many types of lace there are. They fall into some main categories. Needle lace, tape lace, bobbin lace, cutwork, knitted, knotted, as well as the type that my character Pearl makes which is Irish crochet lace. Each lace has its own distinctive look. Lace has been worn as clothing decoration as well as used for home decorating. I remember my grandmother having lace pinned to the arms and back of upholstered chairs in her home. I didn’t know what they were called but thought they were pretty. I messed with them all the time. They are antimacassars and were used to prevent soiling of the upholstery. 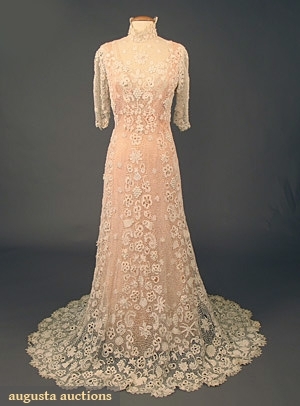 Pearl’s Will takes place in St. Joseph, Missouri in 1910, a time when lace was extremely popular not simply as an embellishment but for entire garments. Pearl makes Irish lace and supplements her income selling lace in Will’s shop. It’s one of the things that brings them together. Sorry, no more clues that that. Well, she does make an Irish lace wedding gown in the book. 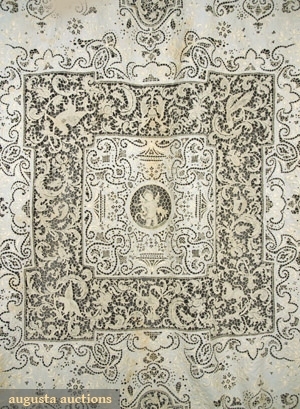 Various types of lace were often combined in the same item, either garments or household items. 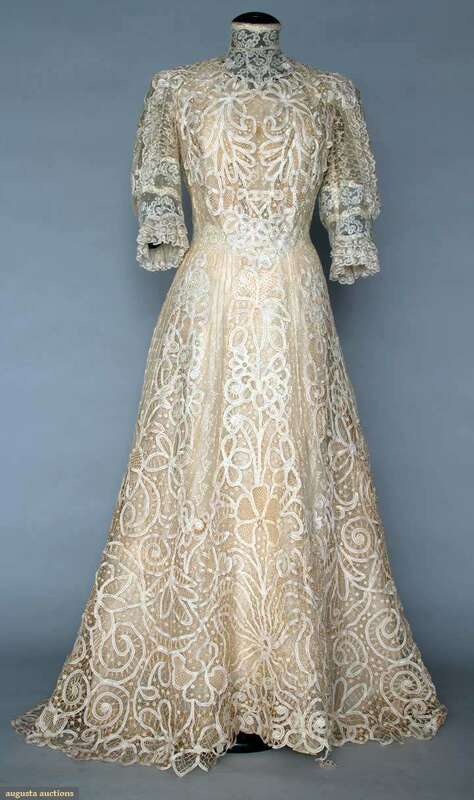 This gown combines Battenberg tape lace with Valenciennes Lace insets. Lace coats were also popular in the early 20th century. This one combines cutwork embroidery with Irish Crochet lace. Lace was also used as decorative borders on tablecloths and handkerchiefs. Somewhere in the depths of my basement is a box with my grandmother's handkerchiefs. Maybe someday I'll find it and post some photos of her lace-edged handkerchiefs. Pearl's Will is available for pre-order starting Jan. 4 and will release Feb. 1 on Kindle and in print on Amazon.